Welcome to 2019 Interzum Guangzhou/CIFM Exhibition on 28th Mar. to 31th Mar. at 11.1D18! ■ Prevents chipping out on the underside of laminated panels. ■ The rise and fall is motorised, the lateral adjustment manual. ■ The scorer blade moves to the height stored when switching on the scorer. 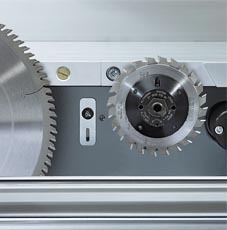 When either the main or scoring motor is switched off, the scoring blade moves back under the table. ■ The scorer has an independent 0.75 kW (1 HP) motor and runs at 8200 rpm.